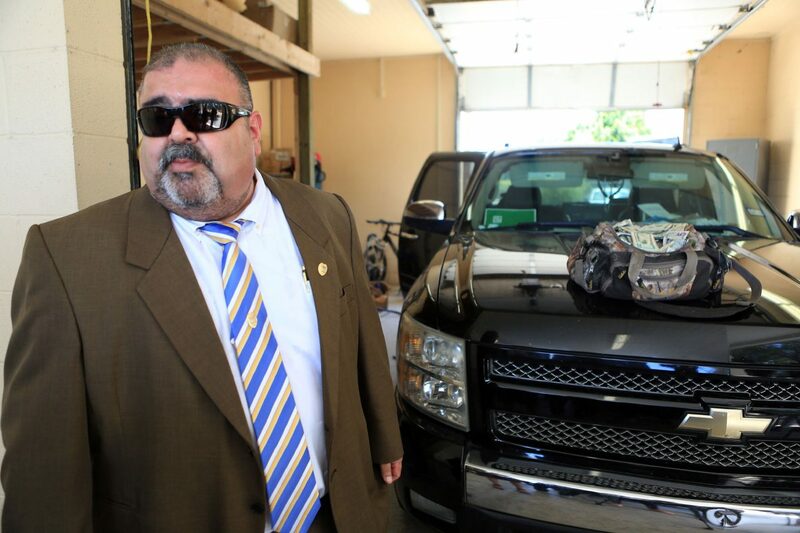 Alamo Police Chief Baudelio Castillo stands beside a truck seized during a drug bust made by the department's new K-9 unit. Castillo discussed the new unit and seizure at the Alamo Police Department Wednesday, Aug. 22, 2018 in Alamo. ALAMO — The police department here has added a new member to its force: Standing four legs tall and more than a year old, Roni stands out from his colleagues. The German Shepherd-Belgian Malinois mix is the department’s first K-9 unit, an addition made possible by a donation from the Pharr-San Juan-Alamo Independent School District. The district purchased the $8,500 narcotics detector dog for the department from Pacesetter K9, a training operation in Liberty, Texas. Officer Mario Garcia introduces his K-9 unit Roni to members of the media at the Alamo Police Department Wednesday, Aug. 22, 2018, in Alamo. Roni was assigned to officer Mario Garcia, another relatively new addition to the force, having been hired three months ago. The pair spent the past three weeks going through an intensive training program at Pacesetter, from which they graduated Aug. 17. In addition to patrolling the city of Alamo, Garcia and Roni will conduct random drug sweeps of the district’s campuses and school facilities and also participate in drug prevention programs. Roni can also be used to track suspects or missing people. 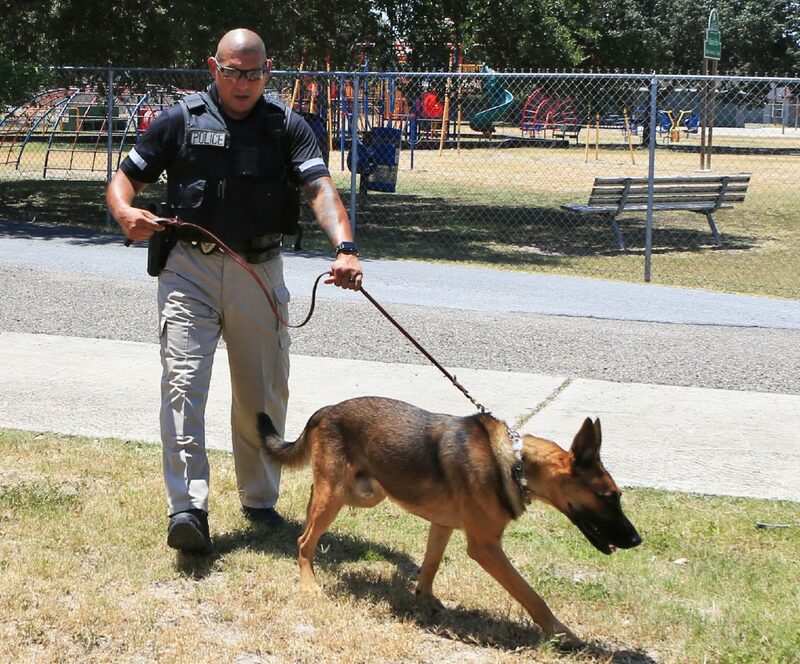 Garcia is no stranger to handling K-9s, having spent the past seven of his nine years in law enforcement working with narcotics detection dogs, as a K-9 handler with the city of Edcouch and the Weslaco Independent School District. PSJA ISD paid for Roni through its safety and security budget, and he is the first dog the district has purchased for the local police departments, which it partners with for school security. In addition to Roni, a K-9 unit belonging to the Pharr Police Department patrols the district’s campuses. The Alamo Police Department will cover Roni’s annual expenses, which include food, upkeep and veterinary expenses, which will cost the department approximately $15,000 annually, according to Chief Baudelio Castillo. The department has budgeted for these costs for the first year, after which point they will come from the PD’s forfeiture fund, Castillo said. Roni made his first drug bust Wednesday, when a routine traffic stop Garcia conducted resulted in the discovery of a kilogram of cocaine, a half-pound of marijuana and approximately $13,000 in cash. Two suspects were arrested on possession of controlled substance charges. This story has been updated with a detailed breakdown of Wednesday’s drug bust.